What should my file format be? We ask all submitted work contain a print-ready PDF with bleed and single pages. If possible, working files (in-case you request us to make a change). What is a proof and why should I look at it? What should be resolution be? All files and links must be provided at a minimum of 300 dpi (dots per inch) resolution. Most images from the web are designed at 72 dpi and will not print the best it could. If images are not 300 dpi, there will be a substantial drop in image quality. How do I send my direct mail list? Many mail lists are submitted incorrectly without separate columns for each field (Business, Name, Address, City, State, Zip, etc.) It is necessary for each category to be separated into its own column. If your mailing list is not submitted correctly, it could delay your job and possibly incur additional costs if we fix it. * The First Name and Last Name fields can be combined into one single field (Full Name). If you need to submit more than one mailing list for your job, you will be charged for the additional lists. Either submit the mail lists in different files or, if you choose to have them on separate worksheets, please inform us so we know to include them. How will you use my fonts? In order for us to print the project exactly how you need, all fonts must be embedded in your PDF file. Please note, certain fonts have copyright restrictions and will not be allowed to be embedded in your PDF file. Please embed all images and text in Adobe Illustrator files. These elements are needed to open and work with the file. Flatten all layers when working in photoshop. What mail piece size qualifies for postcard rate? We have provided an excellent graphic with all the dimensions you may need. Do you offer CASS Certification and NCOA (National Change of Address)? Yes, we offer both of these services and they are done to all mailing lists. What happens to undeliverable mail? Can I request that it will be returned to me? By providing the standard service of running the mail list through the Move Update database, this should eliminate the majority of the undeliverable addresses. But to catch all of them, just tell customer service to add an endorsement line (i.e. Return Service Requested) on each mail piece. When doing a First Class mailing, this service is free. When doing a Standard mailing you will be charged for each piece being returned. The fee itself will be determined by what type of endorsement, where is it being returned from and/or the weight. Can I use my own font on the address part of my mailer? The USPS recommends the following fonts for your direct mailer. Can my non-profit get cheaper prices for mailing? You may be aware that special nonprofit prices are available for some Periodicals and USPS Marketing Mail mailers, but you may not know who is eligible for those privileges. Nonprofit postage is lower than regular prices, but not everyone can qualify. The following information will help you determine if your business or organization is eligible for nonprofit postage privileges. Organizations wishing to mail at nonprofit USPS Marketing Mail prices first must be authorized by the Postal Service as eligible. Then, they must make sure that the material being mailed complies with strict requirements for nonprofit prices. We here at Colortech can help you get your non-profit qualifications. Nonprofit postage prices are available only for domestic mail, not for international mail. Please review Publication 417, Nonprofit USPS Marketing Mail Eligibility, or get advice from your Business Mail Entry Unitpersonnel while you are designing your nonprofit material, especially if your mailpiece contains any advertising. A nonprofit status from the IRS does not automatically qualify you to mail at nonprofit prices. Publication 417 and your Business Mail Entry Unit office can assist in the determination. To learn more about USPS Marketing Mail nonprofit prices, click below. Who qualifies for nonprofit prices? Do you provide match mailings? Why use match mailing? Match mailing is the process of producing and inserting multiple personalized pieces into a single mail package. Receiving a personalized mail package is becoming more and more popular because companies have learned that when targeted directly and personally, an individual is more apt to respond to the campaign being promoted. What are the address requirements for mail piece? Postcards, Letters, Self-Mailers And Booklets. All of these have the same addressing options. First, put the barcode with the address. It must be at least a 1/2 inch from the right edge as well as at least 5/8 from the bottom edge. You need to stay 1/8 inch away from text and images and the maximum distance the address can be from the bottom of the mailer is 3.5 inches. We usually recommend to customers to leave an area of about 4 inches by 2 inches for the address and barcode. This area must be clear of UV coating, varnish, images and other text. The second option is to use the bottom right area for the barcode, which is referred to as the barcode clear zone. If you want to use this area you need to keep all images, color and text out of the bottom 5/8 area. The address would then have the same placement requirements as your first option. These are required to have the address block in the upper half of the short edge. 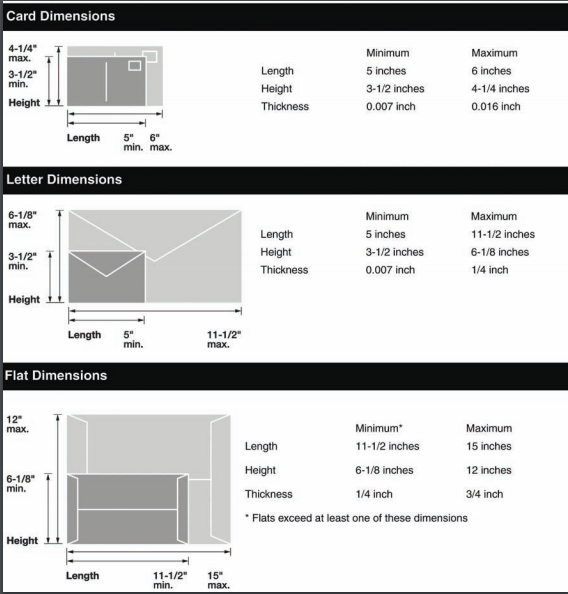 For instance, with an 8.5-inch-by-11-inch mailer, you would need to address from the top of the piece down only to 5.5; don’t address below the 5.5. There is no barcode clear zone for flats. You will need to use an address block that includes the barcode, a 4-inch-by-2-inch clear area, no varnish, UV coating, text or images. You must also make sure that you have at least a .125-inch clearance for the address block from the edge of the piece and any text or graphics.